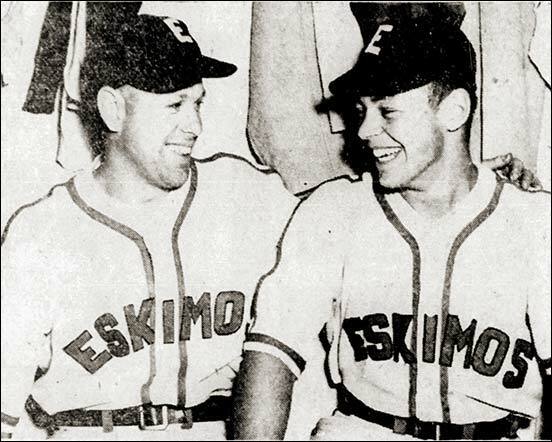 Jack McGill (left) and Brent MacNabb combined to give the Edmonton Eskimos a 5-4 verdict over the Dodgers Wednesday to pull a full two games ahead in the standings. MacNabb came in as pinch-hitter in the ninth and singled to drive in two runs to tie the score. Then, he notched the winning run when leftfielder McGill rapped a single. 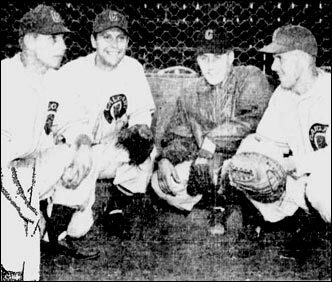 Above right - Four players from the University of Arizona moved into the Calgary Buffaloes camp (left to right) Clarke Duncan, Lloyd Jenney, an All-American, Jim Starkey and Jerry Dobson. 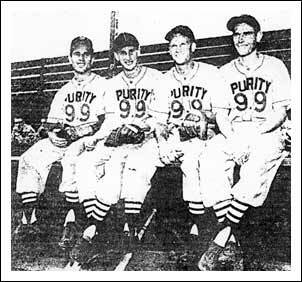 Above left - Calgary Buffaloes featured college All-American Lloyd Jenney from the University of Arizona. 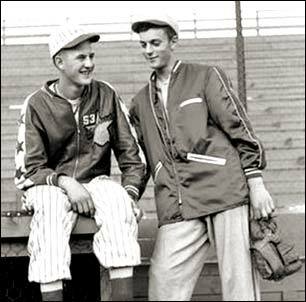 Above right - Two of the stars of Cal's Dodgers, who upset John Ducey's Edmonton Eskimos to capture the 1950 Big Four championship -- Don Stewart, left, and pitcher Vern Callihan, right. 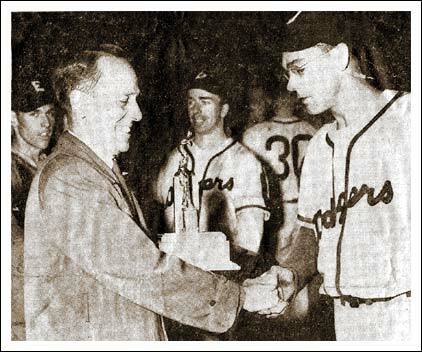 Left - Dodgers' Jim Ryan accepts congratulations on winning the league championship. 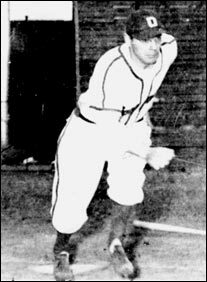 Below - Edmonton shortstop and future major leaguer, Bob Lillis. Lillis was given the star treatment in Edmonton. The talented Southern California product was called the best player ever to perform at Renfrew Park. He was Mr. Shorstop, the sparkplug of the team. 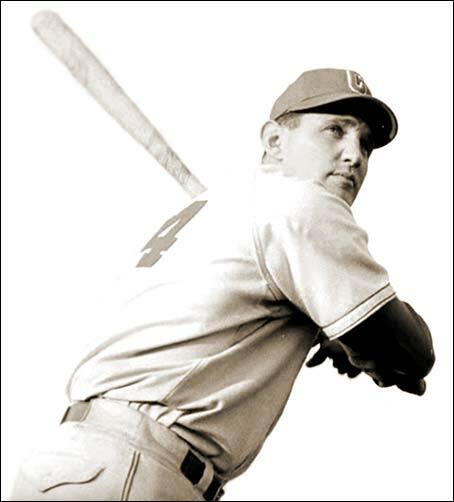 After winning the batting title in 1950 with a .409 mark, and spending two years in military service, he went on to a 10-year playing career in the major leagues, with the Dodgers and Houston. Later, after working in the scouting a player development areas, Lillis managed the Astros for three seasons. In Calgary, it was a local product garnering the headlines. 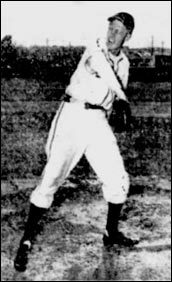 Glen Gorbous, a 19-year-old third baseman / outfielder from Vulcan, Alberta finished second to Lillis in the batting race with a .374 average while leading the loop in home runs and doubles. He'd later be known for a fabulous throwing arm from the outfield. In 1957, he recorded a throw of 445 feet, 10 inches and won a place in the Guinnes Book of World Records. That's import catcher Gus Buono with Gorbous in the photo at the left. 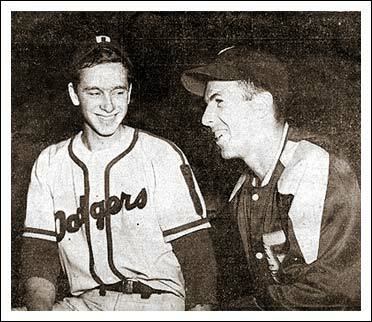 Gorbous had signed with the Dodgers in 1949 and played in their system in '49 and part of 1950 before coming home. 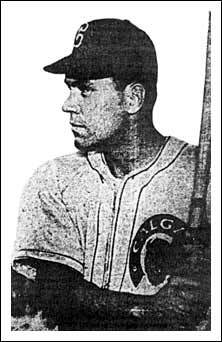 He resumed his pro career in 1951 and advanced to the majors for parts of three seasons. Left - Jim Ryan of the Dodgers, quick out of the box. 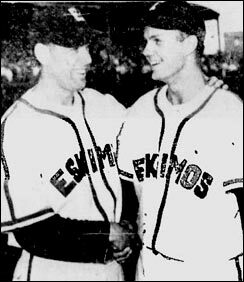 Middle - George Bradish and Jack McGill of the Edmonton Eskimos congratulate each other as their homers played pivotal roles in a double-header sweep of the Calgary Buffaloes. 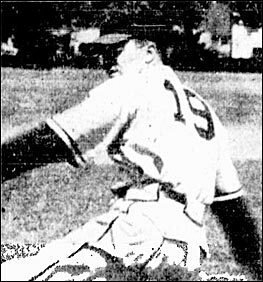 Right - The Edmonton Eskimos reached back to sign up lefty reliever Silver Smith, thought to be between 40 and 50 years of age, believed to have last pitched competitively in the 1930s. A newspaper report noted he was trying a comeback after 13 years in the bleachers. 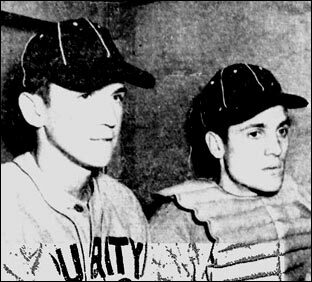 Left - Joe Murphy, right-hander of the Calgary Buffalos. 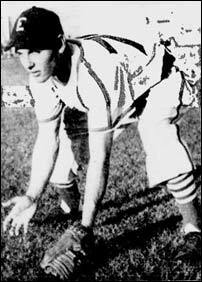 Centre - Outfielder Marshall Johnson of the Edmonton Eskimos. 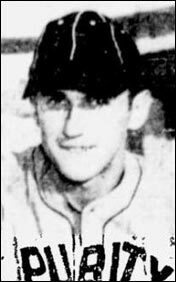 Right - Centre fielder Barry Robertshaw of the Edmonton Dodgers. 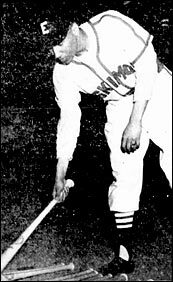 Bill Gadsby, Chicago Blackhawks defenceman and Calgary Buffaloes outfielder. The photo is believed to be from 1950 or 1951. The photo, and the one below, were part of a film, Canadian Cameo, showing the summer activities of hockey stars. It's from Library and Archives Canada. 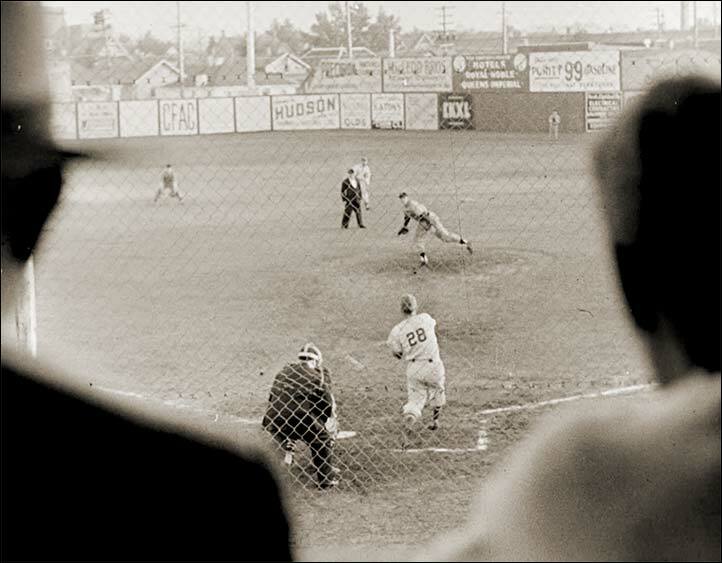 The film identified the batter below as Gadsby, although his number 28 is at odds with the "4" (24?) on his uniform at the left. Nonetheless, it's an interesting photo of the Calgary ballpark, Buffalo Park, in 1950. A couple of the outfield signs are clearly Calgary - CFAC, the Calgary radio and television station and Purity 99 gasoline. 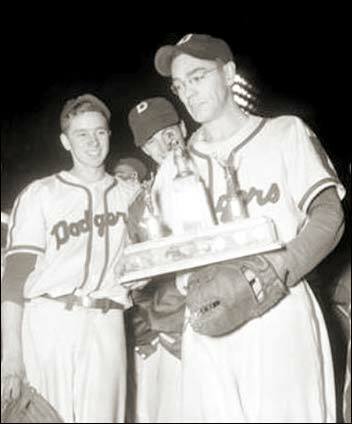 Left - Jim Ryan (holding the trophy) and Don Stewart celebrate the victory by the Edmonton Dodgers over the Edmonton Eskimos for the championship of the Big Four Inter-City League. Dodgers had finished second to the Esks during the regular season.